The "receiving" molecule, most commonly a protein or other biopolymer. The complementary partner molecule which binds to the receptor. Ligands are most often small molecules but could also be another biopolymer. Computational simulation of a candidate ligand binding to a receptor. The orientation of the ligand relative to the receptor as well as the conformation of the ligand and receptor when bound to each other. The process of evaluating a particular pose by counting the number of favorable intermolecular interactions such as hydrogen bonds and hydrophobic contacts. The process of classifying which ligands are most likely to interact favorably to a particular receptor based on the predicted free-energy of binding. Procedure to quantify the predictive capability of a docking protocol. In the field of molecular modeling, docking is a method which predicts the preferred orientation of one molecule to a second when bound to each other to form a stable complex. Knowledge of the preferred orientation in turn may be used to predict the strength of association or binding affinity between two molecules using, for example, scoring functions. Schematic illustration of docking a small molecule ligand (green) to a protein target (black) producing a stable complex. The associations between biologically relevant molecules such as proteins, peptides, nucleic acids, carbohydrates, and lipids play a central role in signal transduction. Furthermore, the relative orientation of the two interacting partners may affect the type of signal produced (e.g., agonism vs antagonism). Therefore, docking is useful for predicting both the strength and type of signal produced. Molecular docking is one of the most frequently used methods in structure-based drug design, due to its ability to predict the binding-conformation of small molecule ligands to the appropriate target binding site. Characterisation of the binding behaviour plays an important role in rational design of drugs as well as to elucidate fundamental biochemical processes. One can think of molecular docking as a problem of “lock-and-key”, in which one wants to find the correct relative orientation of the “key” which will open up the “lock” (where on the surface of the lock is the key hole, which direction to turn the key after it is inserted, etc.). Here, the protein can be thought of as the “lock” and the ligand can be thought of as a “key”. Molecular docking may be defined as an optimization problem, which would describe the “best-fit” orientation of a ligand that binds to a particular protein of interest. However, since both the ligand and the protein are flexible, a “hand-in-glove” analogy is more appropriate than “lock-and-key”. During the course of the docking process, the ligand and the protein adjust their conformation to achieve an overall "best-fit" and this kind of conformational adjustment resulting in the overall binding is referred to as "induced-fit". 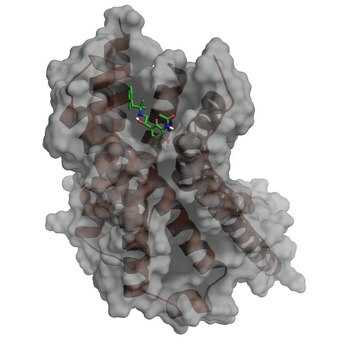 Molecular docking research focuses on computationally simulating the molecular recognition process. It aims to achieve an optimized conformation for both the protein and ligand and relative orientation between protein and ligand such that the free energy of the overall system is minimized. Two approaches are particularly popular within the molecular docking community. One approach uses a matching technique that describes the protein and the ligand as complementary surfaces. The second approach simulates the actual docking process in which the ligand-protein pairwise interaction energies are calculated. Both approaches have significant advantages as well as some limitations. These are outlined below. Geometric matching/ shape complementarity methods describe the protein and ligand as a set of features that make them dockable. These features may include molecular surface / complementary surface descriptors. In this case, the receptor’s molecular surface is described in terms of its solvent-accessible surface area and the ligand’s molecular surface is described in terms of its matching surface description. The complementarity between the two surfaces amounts to the shape matching description that may help finding the complementary pose of docking the target and the ligand molecules. Another approach is to describe the hydrophobic features of the protein using turns in the main-chain atoms. Yet another approach is to use a Fourier shape descriptor technique. Whereas the shape complementarity based approaches are typically fast and robust, they cannot usually model the movements or dynamic changes in the ligand/ protein conformations accurately, although recent developments allow these methods to investigate ligand flexibility. Shape complementarity methods can quickly scan through several thousand ligands in a matter of seconds and actually figure out whether they can bind at the protein’s active site, and are usually scalable to even protein-protein interactions. They are also much more amenable to pharmacophore based approaches, since they use geometric descriptions of the ligands to find optimal binding. Simulating the docking process is much more complicated. In this approach, the protein and the ligand are separated by some physical distance, and the ligand finds its position into the protein’s active site after a certain number of “moves” in its conformational space. The moves incorporate rigid body transformations such as translations and rotations, as well as internal changes to the ligand’s structure including torsion angle rotations. Each of these moves in the conformation space of the ligand induces a total energetic cost of the system. Hence, the system's total energy is calculated after every move. The obvious advantage of docking simulation is that ligand flexibility is easily incorporated, whereas shape complementarity techniques must use ingenious methods to incorporate flexibility in ligands. Also, it more accurately models reality, whereas shape complimentary techniques are more of an abstraction. Clearly, simulation is computationally expensive, having to explore a large energy landscape. Grid-based techniques, optimization methods, and increased computer speed have made docking simulation more realistic. To perform a docking screen, the first requirement is a structure of the protein of interest. Usually the structure has been determined using a biophysical technique such as x-ray crystallography or NMR spectroscopy, but can also derive from homology modeling construction. This protein structure and a database of potential ligands serve as inputs to a docking program. The success of a docking program depends on two components: the search algorithm and the scoring function. The search space in theory consists of all possible orientations and conformations of the protein paired with the ligand. However, in practice with current computational resources, it is impossible to exhaustively explore the search space—this would involve enumerating all possible distortions of each molecule (molecules are dynamic and exist in an ensemble of conformational states) and all possible rotational and translational orientations of the ligand relative to the protein at a given level of granularity. Most docking programs in use account for the whole conformational space of the ligand (flexible ligand), and several attempt to model a flexible protein receptor. Each "snapshot" of the pair is referred to as a pose. genetic algorithms to "evolve" new low energy conformations and where the score of each pose acts as the fitness function used to select individuals for the next iteration. Conformations of the ligand may be generated in the absence of the receptor and subsequently docked or conformations may be generated on-the-fly in the presence of the receptor binding cavity, or with full rotational flexibility of every dihedral angle using fragment based docking. Force field energy evaluation are most often used to select energetically reasonable conformations, but knowledge-based methods have also been used. Peptides are both highly flexible and relatively large-sized molecules, which makes modeling their flexibility a challenging task. A number of methods were developed to allow for efficient modeling of flexibility of peptides during protein-peptide docking. Computational capacity has increased dramatically over the last decade making possible the use of more sophisticated and computationally intensive methods in computer-assisted drug design. However, dealing with receptor flexibility in docking methodologies is still a thorny issue. The main reason behind this difficulty is the large number of degrees of freedom that have to be considered in this kind of calculations. Neglecting it, however, in some of the cases may lead to poor docking results in terms of binding pose prediction. Multiple static structures experimentally determined for the same protein in different conformations are often used to emulate receptor flexibility. Alternatively rotamer libraries of amino acid side chains that surround the binding cavity may be searched to generate alternate but energetically reasonable protein conformations. Docking programs generate a large number of potential ligand poses, of which some can be immediately rejected due to clashes with the protein. The remainder are evaluated using some scoring function, which takes a pose as input and returns a number indicating the likelihood that the pose represents a favorable binding interaction and ranks one ligand relative to another. The components consist of solvent effects, conformational changes in the protein and ligand, free energy due to protein-ligand interactions, internal rotations, association energy of ligand and receptor to form a single complex and free energy due to changes in vibrational modes. A low (negative) energy indicates a stable system and thus a likely binding interaction. An alternative approach is to derive a knowledge-based statistical potential for interactions from a large database of protein-ligand complexes, such as the Protein Data Bank, and evaluate the fit of the pose according to this inferred potential. There are a large number of structures from X-ray crystallography for complexes between proteins and high affinity ligands, but comparatively fewer for low affinity ligands as the later complexes tend to be less stable and therefore more difficult to crystallize. Scoring functions trained with this data can dock high affinity ligands correctly, but they will also give plausible docked conformations for ligands that do not bind. This gives a large number of false positive hits, i.e., ligands predicted to bind to the protein that actually don't when placed together in a test tube. One way to reduce the number of false positives is to recalculate the energy of the top scoring poses using (potentially) more accurate but computationally more intensive techniques such as Generalized Born or Poisson-Boltzmann methods. the presence of induce-fit models. Docking accuracy represents one measure to quantify the fitness of a docking program by rationalizing the ability to predict the right pose of a ligand with respect to that experimentally observed. Docking screens can be also evaluated by the enrichment of annotated ligands of known binders from among a large database of presumed non-binding, “decoy” molecules. In this way, the success of a docking screen is evaluated by its capacity to enrich the small number of known active compounds in the top ranks of a screen from among a much greater number of decoy molecules in the database. The area under the receiver operating characteristic (ROC) curve is widely used to evaluate its performance. Resulting hits from docking screens are subjected to pharmacological validation (e.g. IC50, affinity or potency measurements). Only prospective studies constitute conclusive proof of the suitability of a technique for a particular target. The potential of docking programs to reproduce binding modes as determined by X-ray crystallography can be assed by a range of docking benchmark sets. For small molecules, several benchmark data sets for docking and virtual screening exist e.g. Astex Diverse Set consisting of high quality protein−ligand X-ray crystal structures or the Directory of Useful Decoys (DUD) for evaluation of virtual screening performance. An evaluation of docking programs for their potential to reproduce peptide binding modes can be assessed by Lessons for Efficiency Assessment of Docking and Scoring (LEADS-PEP). hit identification – docking combined with a scoring function can be used to quickly screen large databases of potential drugs in silico to identify molecules that are likely to bind to protein target of interest (see virtual screening). lead optimization – docking can be used to predict in where and in which relative orientation a ligand binds to a protein (also referred to as the binding mode or pose). This information may in turn be used to design more potent and selective analogs. Bioremediation – Protein ligand docking can also be used to predict pollutants that can be degraded by enzymes. ^ Lengauer T, Rarey M (Jun 1996). "Computational methods for biomolecular docking". Current Opinion in Structural Biology. 6 (3): 402–6. doi:10.1016/S0959-440X(96)80061-3. PMID 8804827. ^ Kitchen DB, Decornez H, Furr JR, Bajorath J (Nov 2004). "Docking and scoring in virtual screening for drug discovery: methods and applications". Nature Reviews. Drug Discovery. 3 (11): 935–49. doi:10.1038/nrd1549. PMID 15520816. ^ Jorgensen WL (Nov 1991). "Rusting of the lock and key model for protein-ligand binding". Science. 254 (5034): 954–5. doi:10.1126/science.1719636. PMID 1719636. ^ Wei BQ, Weaver LH, Ferrari AM, Matthews BW, Shoichet BK (Apr 2004). "Testing a flexible-receptor docking algorithm in a model binding site". Journal of Molecular Biology. 337 (5): 1161–82. doi:10.1016/j.jmb.2004.02.015. PMID 15046985. ^ Goldman BB, Wipke WT (2000). "QSD quadratic shape descriptors. 2. Molecular docking using quadratic shape descriptors (QSDock)". Proteins. 38 (1): 79–94. doi:10.1002/(SICI)1097-0134(20000101)38:1<79::AID-PROT9>3.0.CO;2-U. PMID 10651041. ^ Meng EC, Shoichet BK, Kuntz ID (1992). "Automated docking with grid-based energy evaluation". Journal of Computational Chemistry. 13 (4): 505–524. doi:10.1002/jcc.540130412. ^ Morris GM, Goodsell DS, Halliday RS, Huey R, Hart WE, Belew RK, Olson AJ (1998). "Automated docking using a Lamarckian genetic algorithm and an empirical binding free energy function". Journal of Computational Chemistry. 19 (14): 1639–1662. CiteSeerX 10.1.1.471.5900. doi:10.1002/(SICI)1096-987X(19981115)19:14<1639::AID-JCC10>3.0.CO;2-B. ^ a b Feig M, Onufriev A, Lee MS, Im W, Case DA, Brooks CL (Jan 2004). "Performance comparison of generalized born and Poisson methods in the calculation of electrostatic solvation energies for protein structures". Journal of Computational Chemistry. 25 (2): 265–84. doi:10.1002/jcc.10378. PMID 14648625. ^ Shoichet BK, Kuntz ID, Bodian DL (2004). "Molecular docking using shape descriptors". Journal of Computational Chemistry. 13 (3): 380–397. doi:10.1002/jcc.540130311. ^ Cai W, Shao X, Maigret B (Jan 2002). "Protein-ligand recognition using spherical harmonic molecular surfaces: towards a fast and efficient filter for large virtual throughput screening". Journal of Molecular Graphics & Modelling. 20 (4): 313–28. doi:10.1016/S1093-3263(01)00134-6. PMID 11858640. ^ Morris RJ, Najmanovich RJ, Kahraman A, Thornton JM (May 2005). "Real spherical harmonic expansion coefficients as 3D shape descriptors for protein binding pocket and ligand comparisons". Bioinformatics. 21 (10): 2347–55. doi:10.1093/bioinformatics/bti337. PMID 15728116. ^ Kahraman A, Morris RJ, Laskowski RA, Thornton JM (Apr 2007). "Shape variation in protein binding pockets and their ligands". Journal of Molecular Biology. 368 (1): 283–301. doi:10.1016/j.jmb.2007.01.086. PMID 17337005. ^ Kearsley SK, Underwood DJ, Sheridan RP, Miller MD (Oct 1994). "Flexibases: a way to enhance the use of molecular docking methods". Journal of Computer-Aided Molecular Design. 8 (5): 565–82. doi:10.1007/BF00123666. PMID 7876901. ^ Friesner RA, Banks JL, Murphy RB, Halgren TA, Klicic JJ, Mainz DT, Repasky MP, Knoll EH, Shelley M, Perry JK, Shaw DE, Francis P, Shenkin PS (Mar 2004). "Glide: a new approach for rapid, accurate docking and scoring. 1. Method and assessment of docking accuracy". Journal of Medicinal Chemistry. 47 (7): 1739–49. doi:10.1021/jm0306430. PMID 15027865. ^ Zsoldos Z, Reid D, Simon A, Sadjad SB, Johnson AP (Jul 2007). "eHiTS: a new fast, exhaustive flexible ligand docking system". Journal of Molecular Graphics & Modelling. 26 (1): 198–212. doi:10.1016/j.jmgm.2006.06.002. PMID 16860582. ^ Wang Q, Pang YP (September 2007). Romesberg F (ed.). "Preference of small molecules for local minimum conformations when binding to proteins". PLOS One. 2 (9): e820. doi:10.1371/journal.pone.0000820. PMC 1959118. PMID 17786192. ^ Klebe G, Mietzner T (October 1994). "A fast and efficient method to generate biologically relevant conformations". Journal of Computer-Aided Molecular Design. 8 (5): 583–606. doi:10.1007/BF00123667. PMID 7876902. ^ Ciemny M, Kurcinski M, Kamel K, Kolinski A, Alam N, Schueler-Furman O, Kmiecik S (May 2018). "Protein-peptide docking: opportunities and challenges". Drug Discovery Today. 23 (8): 1530–1537. doi:10.1016/j.drudis.2018.05.006. PMID 29733895. ^ Antunes DA, Devaurs D, Kavraki LE (December 2015). "Understanding the challenges of protein flexibility in drug design". Expert Opinion on Drug Discovery. 10 (12): 1301–13. doi:10.1517/17460441.2015.1094458. hdl:1911/88215. PMID 26414598. ^ Cerqueira NM, Bras NF, Fernandes PA, Ramos MJ (January 2009). "MADAMM: a multistaged docking with an automated molecular modeling protocol". Proteins. 74 (1): 192–206. doi:10.1002/prot.22146. PMID 18618708. ^ Totrov M, Abagyan R (Apr 2008). "Flexible ligand docking to multiple receptor conformations: a practical alternative". Current Opinion in Structural Biology. 18 (2): 178–84. doi:10.1016/j.sbi.2008.01.004. PMC 2396190. PMID 18302984. ^ Hartmann C, Antes I, Lengauer T (Feb 2009). "Docking and scoring with alternative side-chain conformations". Proteins. 74 (3): 712–26. doi:10.1002/prot.22189. PMID 18704939. ^ Taylor RD, Jewsbury PJ, Essex JW (Oct 2003). "FDS: flexible ligand and receptor docking with a continuum solvent model and soft-core energy function". Journal of Computational Chemistry. 24 (13): 1637–56. CiteSeerX 10.1.1.147.1131. doi:10.1002/jcc.10295. PMID 12926007. ^ Murcko MA (Dec 1995). "Computational Methods to Predict Binding Free Energy in Ligand-Receptor Complexes". Journal of Medicinal Chemistry. 38 (26): 4953–67. doi:10.1021/jm00026a001. PMID 8544170. ^ a b c Huang N, Shoichet BK, Irwin JJ (Nov 2006). "Benchmarking sets for molecular docking". Journal of Medicinal Chemistry. 49 (23): 6789–801. doi:10.1021/jm0608356. PMC 3383317. PMID 17154509. ^ Ballante F, Marshall GR (Jan 2016). "An Automated Strategy for Binding-Pose Selection and Docking Assessment in Structure-Based Drug Design". Journal of Chemical Information and Modeling. 56 (1): 54–72. doi:10.1021/acs.jcim.5b00603. PMID 26682916. ^ Bursulaya BD, Totrov M, Abagyan R, Brooks CL (Nov 2003). "Comparative study of several algorithms for flexible ligand docking". Journal of Computer-Aided Molecular Design. 17 (11): 755–63. doi:10.1023/B:JCAM.0000017496.76572.6f. PMID 15072435. ^ Ballante, Flavio (2018). Protein-Ligand Docking in Drug Design: Performance Assessment and Binding-Pose Selection. Methods in Molecular Biology. 1824. pp. 67–88. doi:10.1007/978-1-4939-8630-9_5. ISBN 978-1-4939-8629-3. ISSN 1940-6029. PMID 30039402. ^ Irwin JJ (2008-02-14). "Community benchmarks for virtual screening". Journal of Computer-Aided Molecular Design. 22 (3–4): 193–9. doi:10.1007/s10822-008-9189-4. PMID 18273555. ^ Hartshorn MJ, Verdonk ML, Chessari G, Brewerton SC, Mooij WT, Mortenson PN, Murray CW (Feb 2007). "Diverse, high-quality test set for the validation of protein-ligand docking performance". Journal of Medicinal Chemistry. 50 (4): 726–41. doi:10.1021/jm061277y. PMID 17300160. ^ Hauser AS, Windshügel B (Dec 2015). "A Benchmark Data Set for Assessment of Peptide Docking Performance". Journal of Chemical Information and Modeling. 56 (1): 188–200. doi:10.1021/acs.jcim.5b00234. PMID 26651532. ^ Suresh PS, Kumar A, Kumar R, Singh VP (Jan 2008). "An in silico [correction of insilico] approach to bioremediation: laccase as a case study". Journal of Molecular Graphics & Modelling. 26 (5): 845–9. doi:10.1016/j.jmgm.2007.05.005. PMID 17606396. Malinauskas T. "Step by step installation of MGLTools 1.5.2 (AutoDockTools, Python Molecular Viewer and Visual Programming Environment) on Ubuntu Linux 8.04". Archived from the original on 2009-02-26. Retrieved 2008-07-15. Click2Drug.org - Directory of computational drug design tools.